Zion Lutheran Church, of rural Hampton and St. Peter Lutheran Church, located in the village of Hampton, join together and recognize that all congregation members create a fellowship of Christians, led by God's Word and guided by the Lutheran Confessions. -non-members who share our philosophy and assist us with carrying out our mission and purpose. -non-Christians who need the hope of eternal life through Christ Jesus. The mission of Hampton Lutheran School is to equip children both spiritually and academically, promoting faith, trust, and growth in their relationship with the one true God. 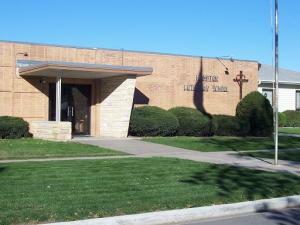 As an important ministry of the congregations, Hampton Lutheran school helps fulfill each of the congregation's five functions: education, worship, evangelism, fellowship, and service. Education occurs daily in all subjects to prepare children to serve God and become responsible stewards of their talents in a joy-filled Christian life. Children are taught the demands of God's law and are comforted by the saving Gospel of Jesus Christ as the faith is integrated throughout all subject areas. All subjects are taught by Lutheran Christians who are academically prepared to teach from the Christian viewpoint. Using their God-given abilities, students and teachers strive for excellence as they use effective, up-to-date learning and teaching materials. Worship in at Hampton Lutheran School is not confined to the daily classroom devotion or to whole-school worship experiences, but occurs throughout the day. Children are helped to grow in their prayer lives, learning to pray privately and together whenever needs or opportunities arise. Teachers provide a Christian model by leading worship in school, by faithfully attending congregational worship, and by participating in other aspects of congregational worship life. Children learn to witness naturally and effectively the good news of Jesus' love. Through their Christian lives, students bear testimony to each other and to their community. Students and staff accept and value one another as fellow members of the body of Christ. They support and encourage each other and witness to one another. The school community and its members are valued as an important part of St. Peter and Zion and of the body of Christ. The Law and the Gospel are the foundation for all the relationships. Teachers and students work together to maintain a classroom atmosphere of love and joy. Teachers encourage Christ-like compassion and love for all people. As opportunity permits, teachers and students volunteer to serve others together and separately. Hampton Lutheran School serves families in various ways and helps parents carry out their parental responsibilities in Christian Education. It is the responsibility of the HLS Administration to present this philosophy statement to all participating children and their families, and to congregation members, on an annual basis for update and review. Documentation of such review process and input received, shall be maintained in the school office.